Le Club AccorHotels has released a new list of hotels where members can earn quadruple points this time for full two months. You can earn quadruple points at these select hotels for stays consumed between January 22 – April 22, 2018, when booked January 22 – March 4. 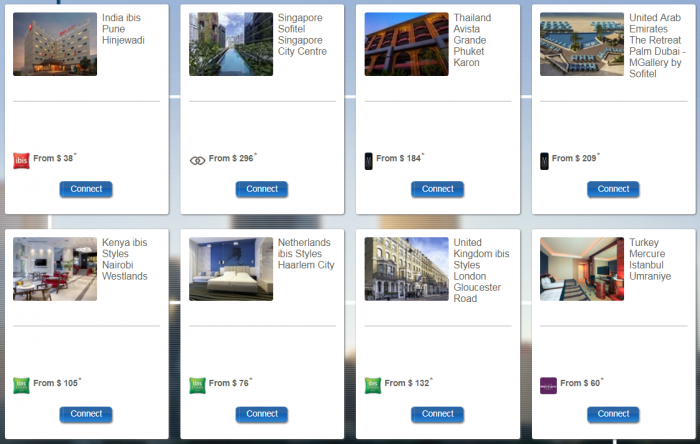 This is the longest list of new hotels with quadruple points that I have seen throughout the years. 2. This offer entitles Le Club AccorHotels members, regardless of their membership status, to multiply by 4 their Rewards points for a stay in one of the participating hotels in the Le Club AccorHotels Loyalty program. This bonus of Rewards points is offered in addition to the Rewards points and Status points that are earned by the Le Club AccorHotels member for each eligible stay as per the Le Club Accorhotels General Conditions of Use and are calculated based on a Classic membership status level earn rate. This promotion is not applicable for Independent Hotels of Le Club AccorHotels. This offer can be used only one (1) time per member during its validity period. 3. This offer is valid for a member’s stay from 22/01/2018 to 22/04/2018 in one of the participating hotels (Cancun Sokhna Managed By Accorhotels, Porto Sokhna Beach Resort, El Jabal Sokhna Hotel, ibis Styles Nairobi Westlands, ibis Mohammedia, Mercure Rio De Janeiro Angra Dos Reis, ibis Styles Goiania Marista, ibis Igrejinha, Novotel Itajai, Grand Mercure Recife Boa Viagem, Mercure Rio De Janeiro Copacabana, Pullman Rio De Janeiro Sao Conrado, Grand Mercure Rio De Janeiro Copacabana, Mercure Curitiba Aeroporto, ibis Styles Curitiba Santa Felicidade, ibis Styles Curitiba Batel, The Capital Managed by AccorHotels, Hotel Belas Artes Sao Paulo Managed by Accorhotels, Grand Plaza Sao Paulo Jardins, Hotel Presidente Uberlandia, ibis Calama, ibis Copiapo, ibis Iquique, ibis Puerto Montt, ibis Styles Lima Conquistadores, Mercure Dwarka, ibis Pune Hinjewadi, ibis Styles Makassar Sam Ratulangi, Hotel Majapahit Surabaya managed by AccorHotels, Sofitel Singapore City Centre, Mercure Singapore On Stevens, ibis Styles Phuket City, Avista Grande Phuket Karon, Novotel Charleroi Centre, ibis Wavre, ibis Styles Paris 16 Sud, ibis Styles Guyancourt Versailles, ibis Styles Paris Nation Cours de Vincennes, Mercure Paris Roissy Charles de Gaulle Hotel, ibis Styles Budapest Airport, Mercure Dolomiti Hotel Boite, ibis Styles Haarlem City, ibis Styles Arad, ibis Styles Genève Palexpo Aéroport, Mercure Lenzburg Krone, Mercure Istanbul Umraniye, ibis Styles London Gloucester Road, ibis Styles Makkah, The Retreat Palm Dubai MGallery by Sofitel), and booked between 22/01/2018 and 04/03/2018. 4. The stay must be a minimum of one (1) night.